From the Editor: The Forum of Sao Paulo is an organization founded in 1990 by Fidel Castro and Lula da Silva, then president of Brazilian Workers Party (PT), in the city of Sao Paulo, Brazil, thence its name. The confessed goal of the organ is “to save what had been lost of Communism in Eastern Europe and the old USSR.” The FSP has brought together most of the leading communist and socialist organizations of Latin America, including notorious terrorist groups. At its meetings, it has hosted as guests many observers from European and Asian Communist parties. The organization called the Forum of São Paulo (FSP) is composed of socialist and communist parties and movements of Latin America, including terrorist groups such as the drug-trafficking guerilla organization FARC (Revolutionary Armed Forces of Colombia). 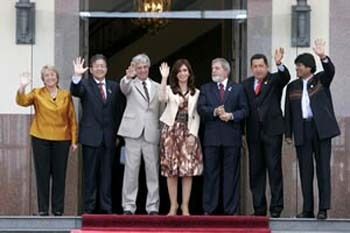 It will gather in Montevideo on May 22-25, 2008 for its XIV meeting, whose central subject will be "The Left in Latin America and the Caribbean in this new time - The wealth of diversity." 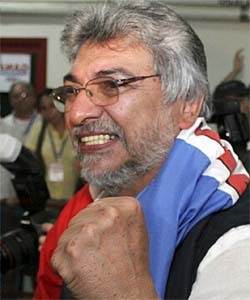 Among the political powers included in the FSP are the Communist Party of Cuba, the radical Movement for Socialism (MAS - Bolivia), The Sandinista Front (FSLN - Nicaragua), the Farabundo Martí Front (FMLN - El Salvador), the Fifth Republic Movement (Venezuela), and the Broad Front of Uruguay led by ex-terrorist, but now “moderate” Tabaré Vázquez, present day president of Uruguay. The FSP was founded in July of 1990 at the request of Cuba’s Communist Party (PCC) and held its first meeting in the city of São Paulo, Brazil, from which it took its name. 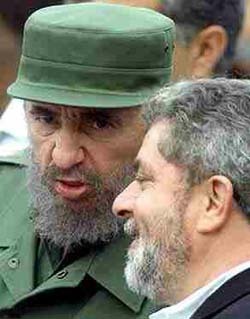 The bloody lifetime dictator of Cuba and the then Communist, now “moderate” Lula da Silva, as leader of Brazil’s Workers’ Party” (PT), were the principal promoters of the FSP. The Brazilian Workers’ Party agreed to the Cuban plan to officiate at the founding of this new transnational leftist group, composed initially of 48 organizations that promised joint international action. At the 2005 FSP meeting 128 organizations were present. The FSP constitutes a revolutionary coalition inspired by the OLAS Conference (OLAS - Latin American Solidarity Organization) founded in Havana in 1967. That conference “exported” Castro’s Communist Revolution to South and Central American countries. The Marxist parties, servile branches of the Russia “central party,” prepared the ground for the installation of guerilla terrorism to combat almost all the governments of Latin America. Today, those same lines continue in a rendition of OLAS – the FSP – that is being unfolded through peaceful, psycho-political and pseudo-democratic means, glazed by a philanthropy and Christian charity. This makes it much more effective and durable in destroying values, principles and institutions, while at the same time it delays, weakens and anesthetizes defensive reactions. Even before the pretended fall of Communism in Eastern Europe and the failure of Marxist guerillas elsewhere, the international left had changed its strategy and embarked on a process of laundering its appearances. It made no significant change of doctrine, but rather only changed its make up, methods and tactics. Today it presents itself as the defender of the poor, striving to psychologically and politically de-structure society, confusing, discouraging and neutralizing those who still have the will to resist the leftist attack. Taking advantage of the general discontent with the failures of the interventionalism of the old dictatorships in South America (which the Communists falsely present as the “neo-liberal” model), now they are launching new “social movements” of political agitation. For this, they count on the complicity of the media and the so-called Catholic left. This year FSP is hoping that the Presidents of the leftist governments in the region will attend its meeting. Among them are Hugo Chavez (Venezuela), Evo Morales (Bolivia), Rafael Correa (Ecuador), Daniel Ortega (Nicaragua), Lula da Silva (Brazil), Cristina Fernández (Argentina), Michelle Bachelet (Chile), and the recently elected president of Paraguay, the Liberation Theology bishop Fernando Lugo. This is the second time that Montevideo will host the FSP meeting, which will also receive communist and socialist delegations from China, Angola, Mozambique and Sweden. The main objective of this leftist transnational group is to fight against what they call neo-Liberalism. The solution for the Continent would be the installation of Socialism. The neo-Socialism proposed by the FSP would have a religious appearance, that of Liberation Theology. It expects a new USSR to be born with the weakening of the political borders of member countries. FSP looks very kindly on guerilla and terrorist actions in diverse countries. It suffices to point out, for example, its sympathies and complicity with the drug-trafficking guerrillas of the FARC in Colombia and with the Spanish terrorist organization ETA. One should remember that far from being opposed to dictatorships as its mendacious propaganda pretends, FSP has been favorable to the tyrannical government of Cuba. Also it has never issued any criticism of the communist dictatorships that lasted decades in Eastern Europe. The members and observers of the Forum of Sao Paulo are declared socialists, communists and even terrorists, and all of them state their hostility toward the United States. Nonetheless, some of its members still receive support from the American Department of State and participate in US-sponsored organizations such as Inter-American Dialogue.